Emily Sanborn is a Licensed Professional Counselor and a Licensed School Counselor in the state of Oregon. She is dedicated to providing a compassionate and collaborative therapeutic experience for children and families, teens, and adults as they navigate life’s stages and struggles. 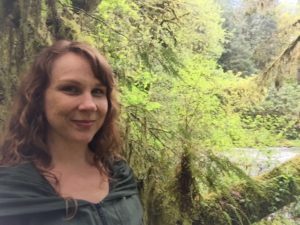 Emily offers an integrative experiential approach to healing that is rooted in existential humanism and enriched with mindfulness based practices and intentional engagement with nature. She incorporates play, social and emotional learning, expressive arts, and ritual in her work. Emily specializes in issues related to childhood and adolescence, parenting and family systems, identity, womanhood, spirituality, and rites of passage. She is experienced in working with people to better manage stress, anxiety, grief, depression, trauma, life transitions, learning differences, and relational concerns. Emily received a Master’s degree in Counseling from Portland State University and a Master’s degree in Interreligious Studies from Union Theological Seminary in New York City. Emily has worked in private practice and as a school counselor. Prior to her counseling career, Emily worked as a middle school teacher, community organizer, outdoor education guide and interfaith chaplain. She draws from her training in education, spirituality, and social justice to thoughtfully explore the variety of ways we make meaning and experience our Self in relationship with the human and nonhuman world. A native of the Chihuahuan Desert, Emily continues to be in awe of the lush Pacific Northwest she now calls home. She studies nature’s self-righting capacity as a fundamental resource for resilience and is continually soothed and humbled by the beauty and mystery of the world. Aside from her professional life, Emily is immersed in the heartfelt work of raising three growing children. She and her family enjoy outdoor adventures, playing together, and following the delightfully surprising path of engaged curiosity.